When male voters went to the polls in California in 1911, one of the questions on the ballot was: Should women be allowed to vote? The issue of woman suffrage was being raised across the country and 5 states, all in the west, had approved the radical and controversial idea. Women had been working for decades to win the franchise. They had to organize in each state because the U.S. Supreme Court took the phrase “all men are created equal” literally. It ruled that protection under the U.S. Constitution did not include women. In response, suffragists began a nationwide campaign in 1848 to win their basic civil rights, which did not reach its goal until August 1920. In 1896 women in California had lost their first contest for the right to vote. When conditions suddenly changed in 1910 and a progressive Republican administration was swept into power, woman suffragists seized the opportunity and successfully lobbied the state legislature to put the question before the voters. Elizabeth Lowe Watson, a former pastor, led the California Equal Suffrage Association in northern California. The less populated south was covered by two organizations, the Political Equality League founded by Pasadena businessman John Hyde Braly, and the Votes for Women Club led by attorney Clara Shortridge Foltz. These and other groups mobilized over 10,000 local supporters – teachers, college women, wage earners and veteran suffragists – to carry out the vast statewide drive. Suffragists spoke to voters in the streets and from automobiles. They held mass rallies, picnics and small meetings. They addressed congregations, unions, factory workers, women’s clubs and any audience they could find. “I appeal to you as a mother, a grandmother, as a garment worker, a school teacher, a trained nurse . . . as the case might be,” was one of the most popular opening lines when addressing a crowd. Experienced speakers from other states came to work alongside local women, and supporters across the country contributed funds. To publicize their Cause as widely as possible, suffragists produced pin-back buttons, pennants and posters. They created post cards, playing cards and shopping bags. They used electric signs, 8-foot tall billboards and lantern slides at night to flash their message. They distributed over three million pieces of literature and over 90,000 Votes for Women buttons in southern California alone. Learning from earlier elections, suffrage leaders anticipated strong opposition by saloon and business interests in the cities who feared prohibition so they concentrated their forces on the rural districts. Speakers, organizers, automobile tours and press material were sent to reach distant voters in the remote corners of the great state. 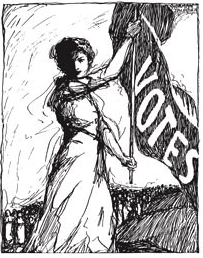 Women in every county organized clubs and associations to win the support of prominent men, newspaper editors, business and clergymen as well as individual voters. Just before the election, 10,000 people gathered for a final “monster rally” in San Francisco, which was followed by fireworks and a band concert. But on Election Day, October 10, 1911, the measure was soundly defeated in the San Francisco Bay Area and just barely passed in Los Angeles. Disheartened and disappointed, suffragists began to plan yet another campaign when late reports from the far flung counties began to swing the vote in their favor. When the long count was finally completed several days later, Equal Suffrage had passed by only 3,587 votes – an average majority of one vote in each precinct in the state! The final tally was 125,037 to 121,450. As suffragists had hoped, work in the rural districts successfully overcame the more organized opposition in the cities. With the passage of votes for women in California, the number of women with full suffrage in the U.S. doubled, and San Francisco became the most populous city in the world in which women could vote. The California campaign helped re-ignite state campaigns across the nation and set a new standard for vibrant public outreach, systematic organizing and innovative approaches. Women throughout the country were exultant and gained new hope that efforts in their own states might yet be successful. With each additional victory, suffragists built up the political power they needed to win passage and ratification of the 19th Amendment to the Constitution, which guaranteed women the right to vote in all the states. The Amendment was finally approved on August 26, 1920, a date now officially recognized as Equality Day. Text adapted with permission from Winning the Vote: The Triumph of the American Woman Suffrage Movement by Robert P. J. Cooney, Jr. The National Women’s History Project has reprinted Bertha Boye’s beautiful “Votes for Women” poster to honor the 100th anniversary of women winning the right to vote in California. On October 10, 1911, California became the sixth state where women could vote equally with men, nine years before the 19th Amendment enfranchised women nationally. 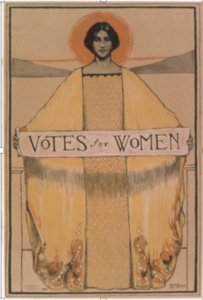 Created by artist Bertha Margaret Boye for the 1911 California campaign, this is probably the most popular poster produced during the American suffrage movement. Boye’s design, featuring a draped western suffragist posed against the Golden Gate as the sun sets behind her, won first place in a contest sponsored by the College Equal Suffrage League in San Francisco. The image was later reproduced on cards, fliers and publicity stamps.